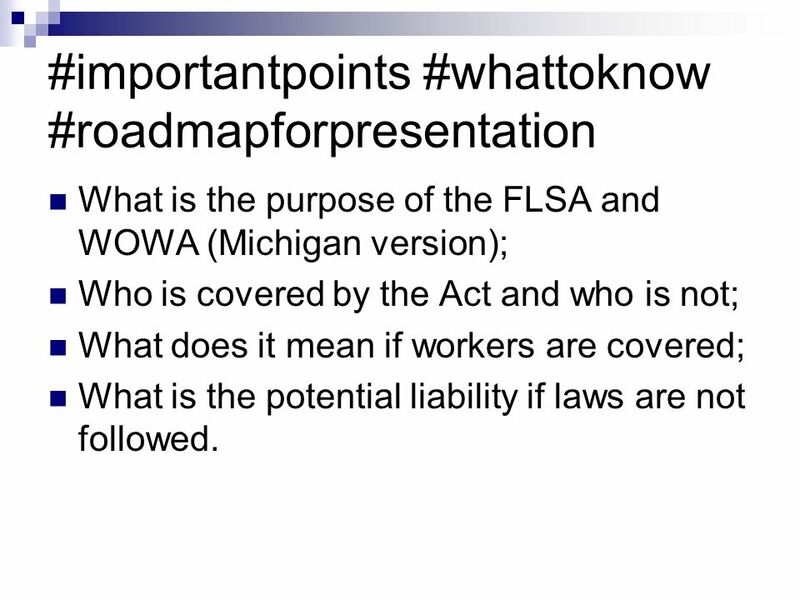 2 #importantpoints #whattoknow #roadmapforpresentation What is the purpose of the FLSA and WOWA (Michigan version); Who is covered by the Act and who is not; What does it mean if workers are covered; What is the potential liability if laws are not followed. 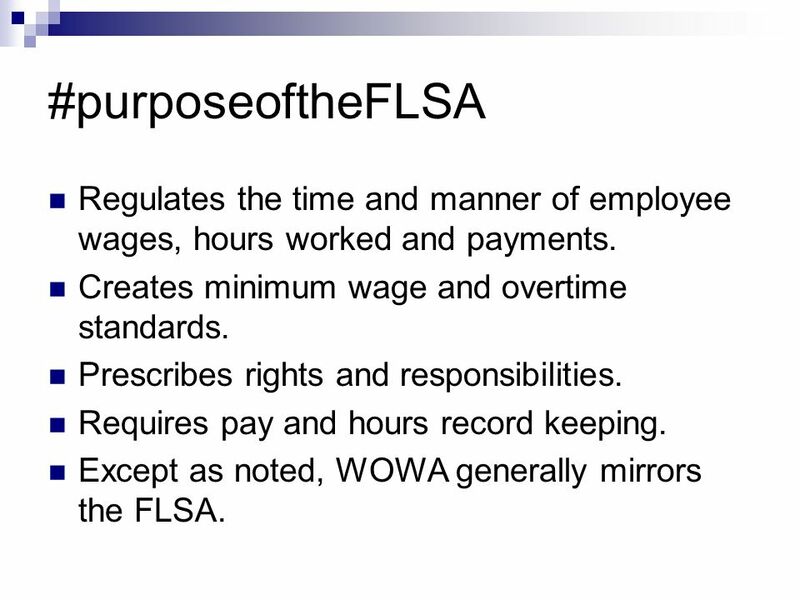 3 #purposeoftheFLSA Regulates the time and manner of employee wages, hours worked and payments. Creates minimum wage and overtime standards. Prescribes rights and responsibilities. Requires pay and hours record keeping. 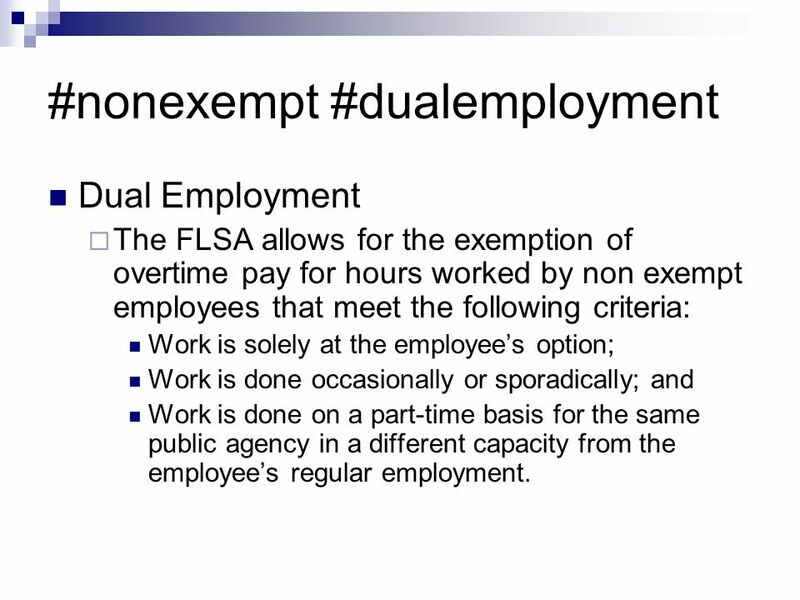 Except as noted, WOWA generally mirrors the FLSA. 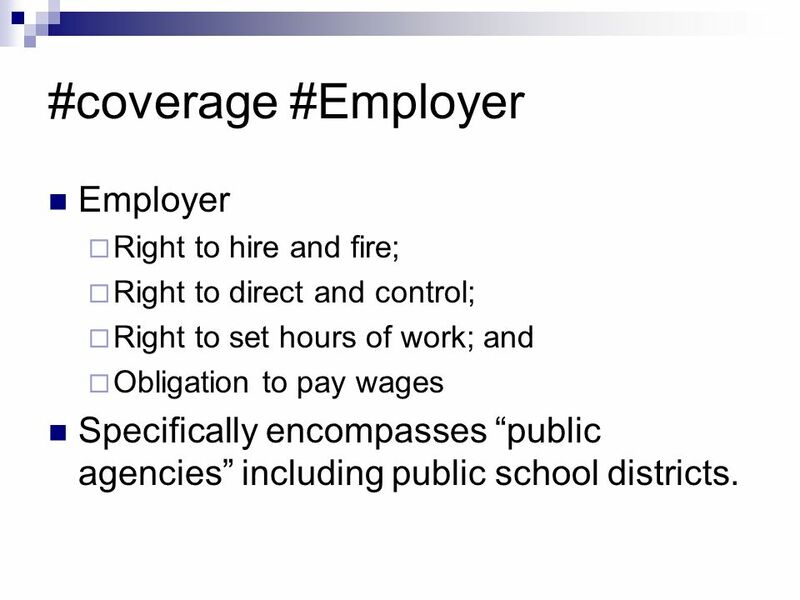 4 #coverage #Employer Employer  Right to hire and fire;  Right to direct and control;  Right to set hours of work; and  Obligation to pay wages Specifically encompasses “public agencies” including public school districts. 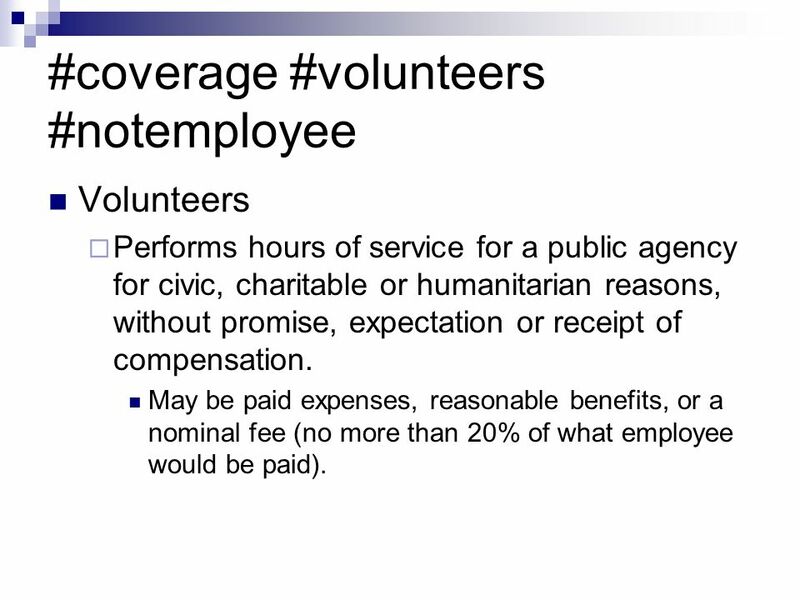 6 #coverage #volunteers #notemployee Volunteers  Performs hours of service for a public agency for civic, charitable or humanitarian reasons, without promise, expectation or receipt of compensation. May be paid expenses, reasonable benefits, or a nominal fee (no more than 20% of what employee would be paid). 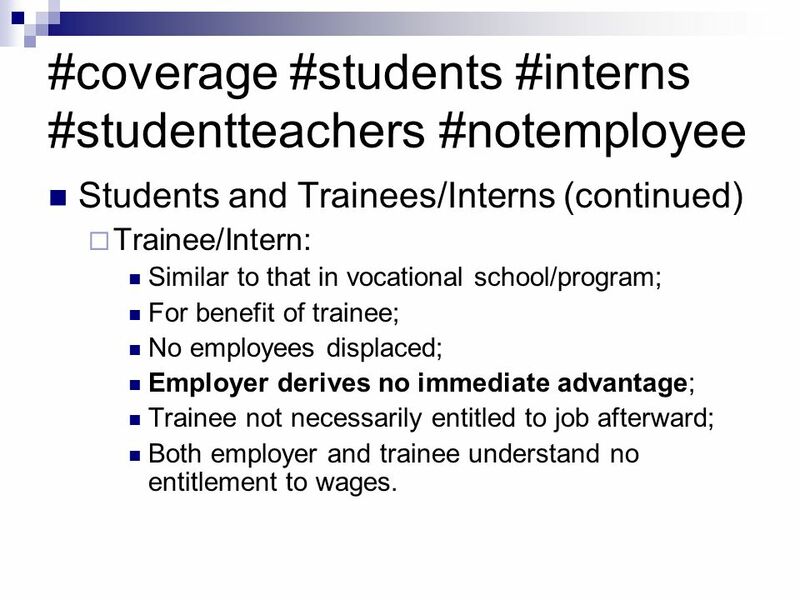 10 #coverage #students #interns #studentteachers #notemployee Students and Trainees/Interns (continued)  Trainee/Intern: Similar to that in vocational school/program; For benefit of trainee; No employees displaced; Employer derives no immediate advantage; Trainee not necessarily entitled to job afterward; Both employer and trainee understand no entitlement to wages. 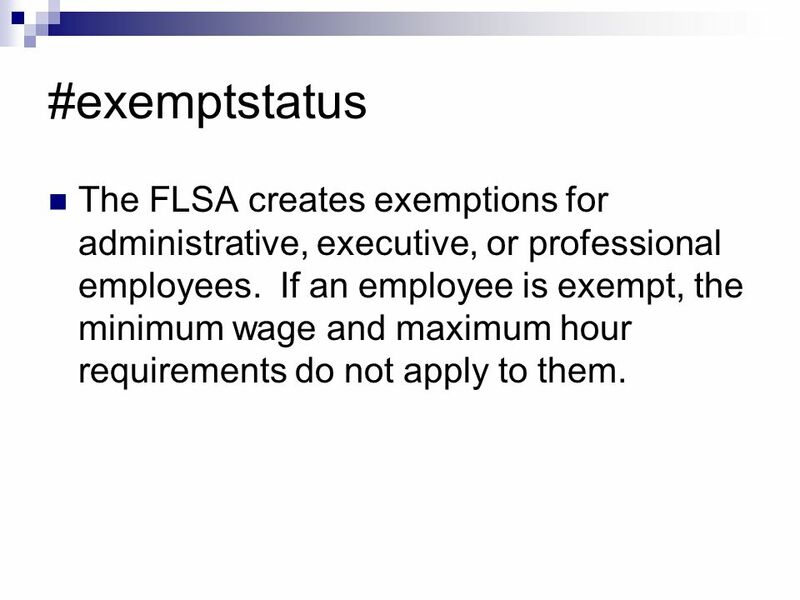 12 #exemptstatus The FLSA creates exemptions for administrative, executive, or professional employees. 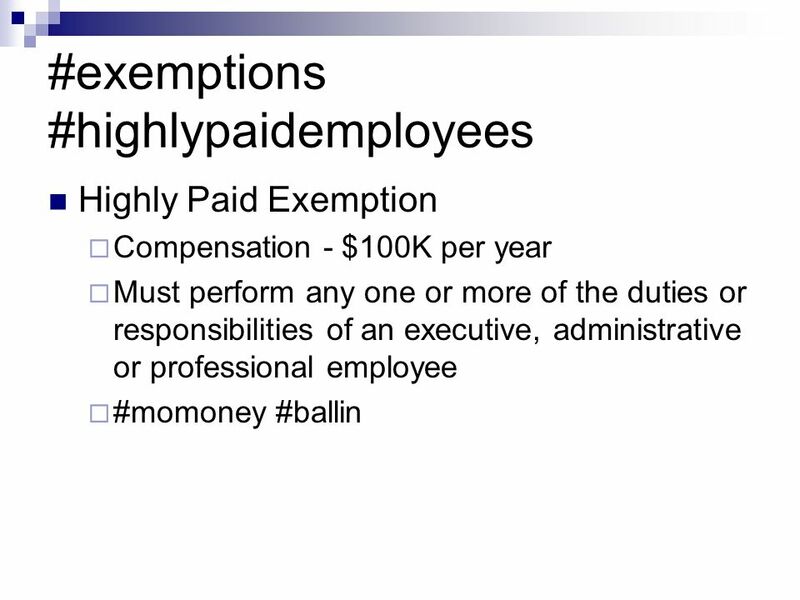 If an employee is exempt, the minimum wage and maximum hour requirements do not apply to them. 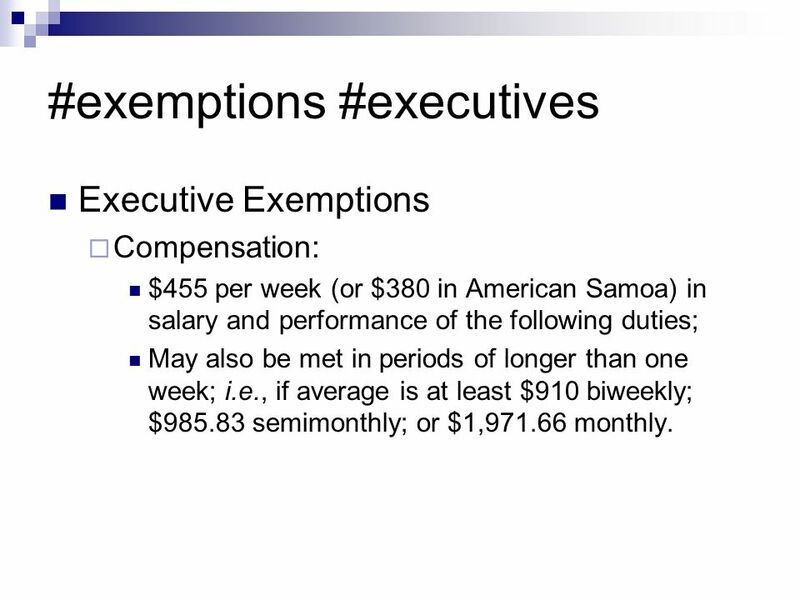 13 #exemptions #executives Executive Exemptions  Compensation: $455 per week (or $380 in American Samoa) in salary and performance of the following duties; May also be met in periods of longer than one week; i.e., if average is at least $910 biweekly; $985.83 semimonthly; or $1,971.66 monthly. 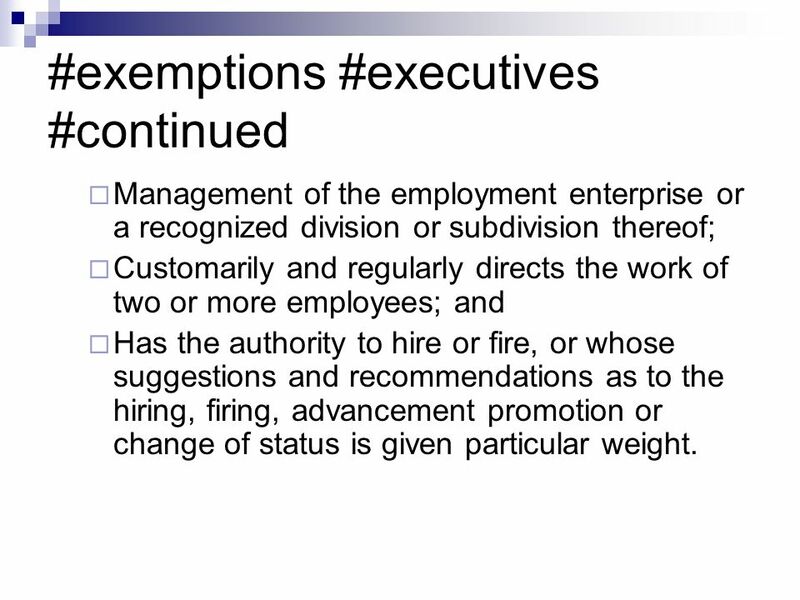 14 #exemptions #executives #continued  Management of the employment enterprise or a recognized division or subdivision thereof;  Customarily and regularly directs the work of two or more employees; and  Has the authority to hire or fire, or whose suggestions and recommendations as to the hiring, firing, advancement promotion or change of status is given particular weight. 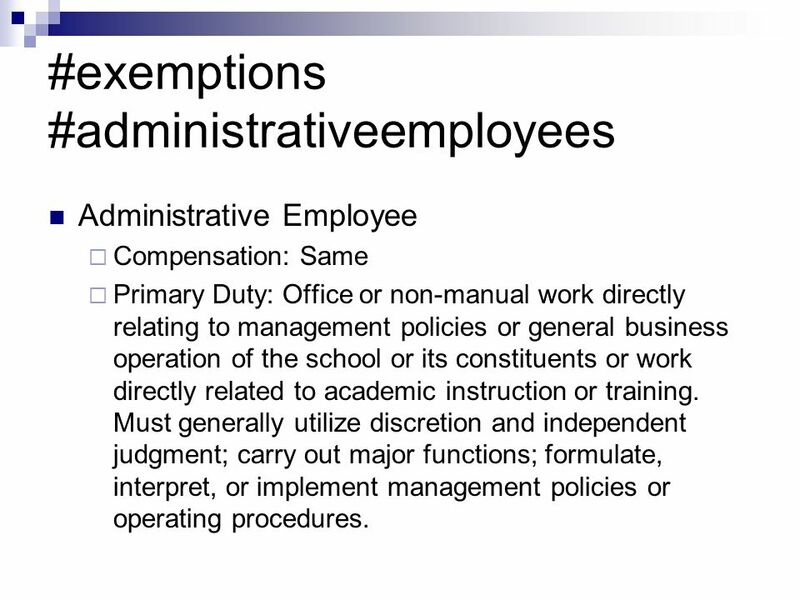 15 #exemptions #administrativeemployees Administrative Employee  Compensation: Same  Primary Duty: Office or non-manual work directly relating to management policies or general business operation of the school or its constituents or work directly related to academic instruction or training. Must generally utilize discretion and independent judgment; carry out major functions; formulate, interpret, or implement management policies or operating procedures. 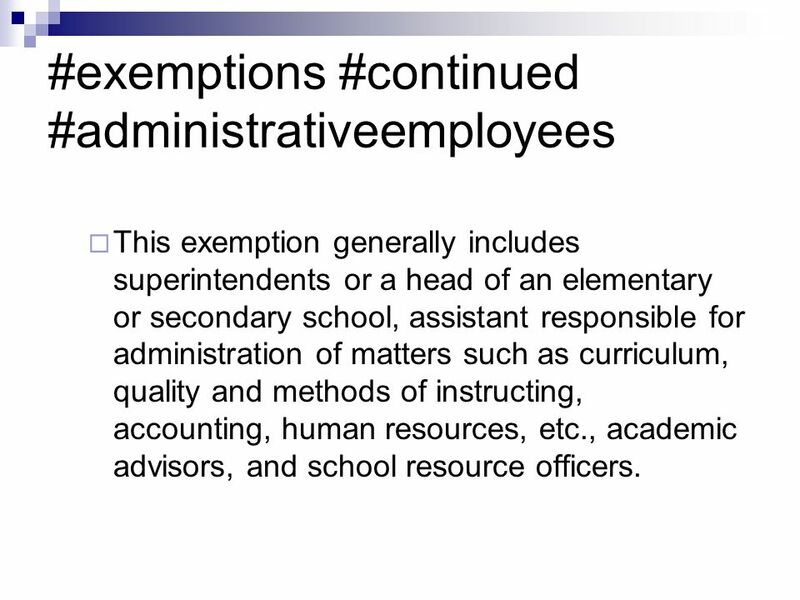 16 #exemptions #continued #administrativeemployees  This exemption generally includes superintendents or a head of an elementary or secondary school, assistant responsible for administration of matters such as curriculum, quality and methods of instructing, accounting, human resources, etc., academic advisors, and school resource officers. 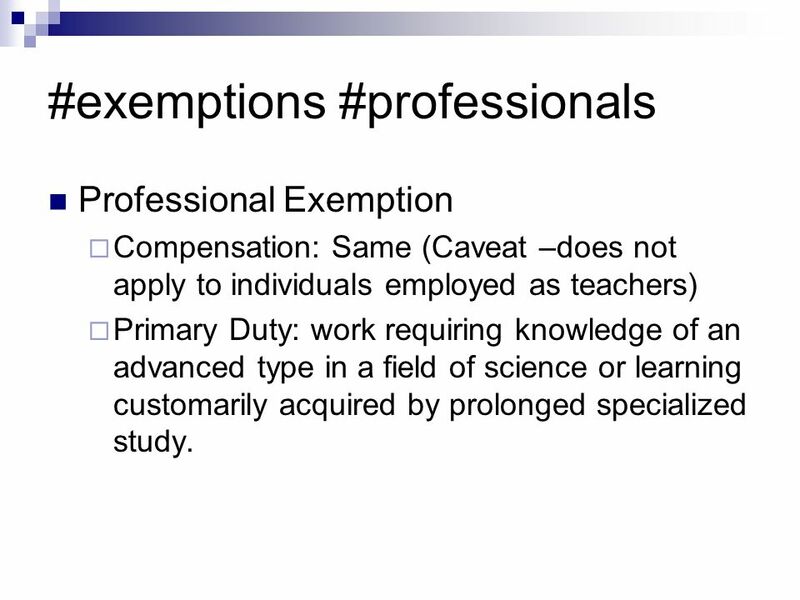 17 #exemptions #professionals Professional Exemption  Compensation: Same (Caveat –does not apply to individuals employed as teachers)  Primary Duty: work requiring knowledge of an advanced type in a field of science or learning customarily acquired by prolonged specialized study. 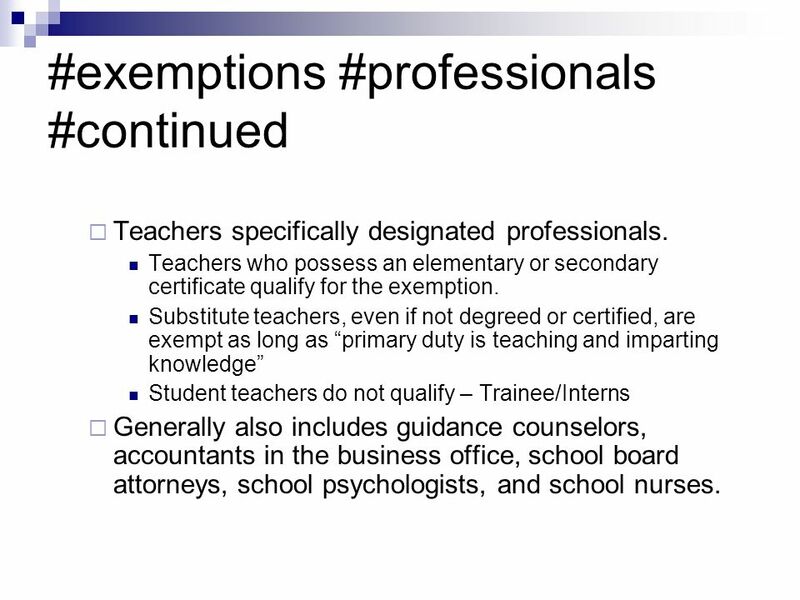 18 #exemptions #professionals #continued  Teachers specifically designated professionals. 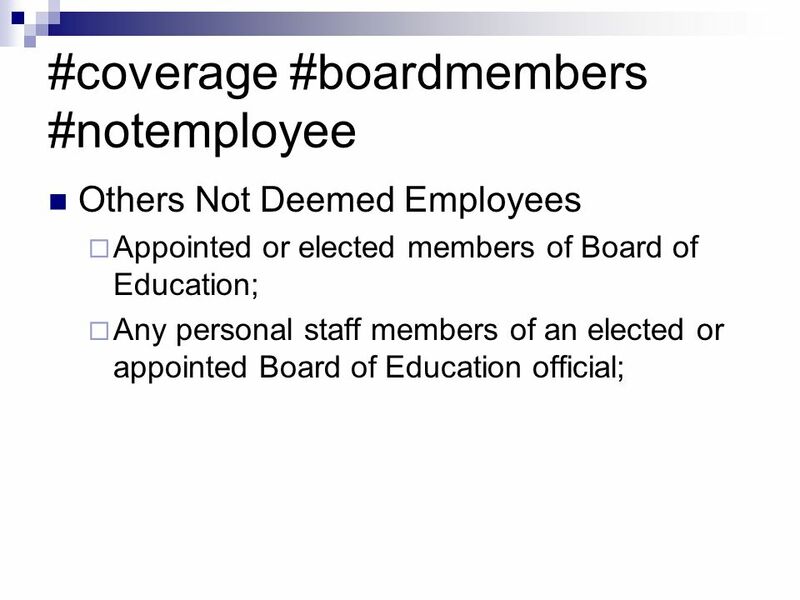 Teachers who possess an elementary or secondary certificate qualify for the exemption. 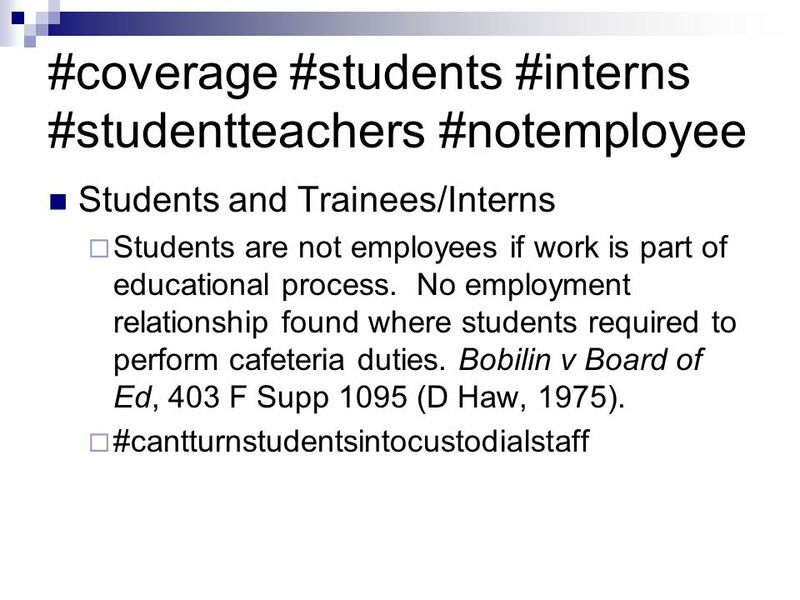 Substitute teachers, even if not degreed or certified, are exempt as long as “primary duty is teaching and imparting knowledge” Student teachers do not qualify – Trainee/Interns  Generally also includes guidance counselors, accountants in the business office, school board attorneys, school psychologists, and school nurses. 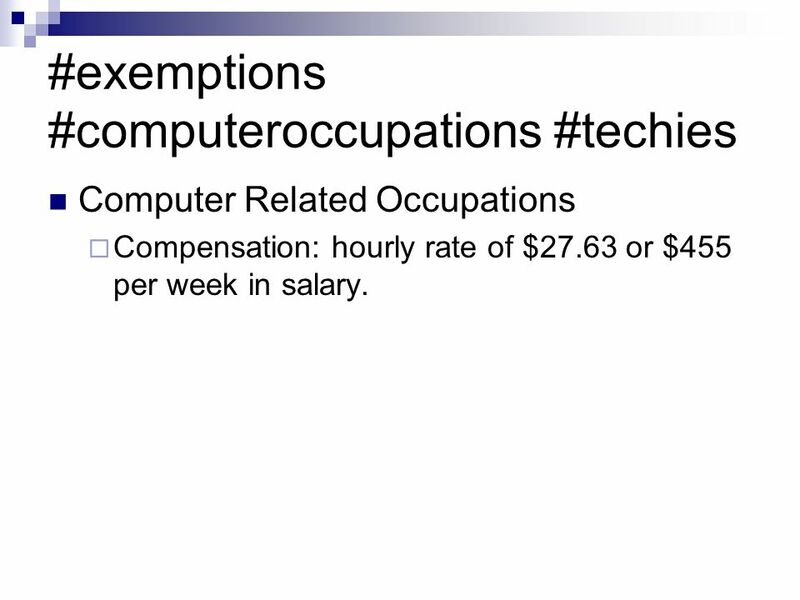 20 #exemptions #computeroccupations #techies Computer Related Occupations  Compensation: hourly rate of $27.63 or $455 per week in salary. 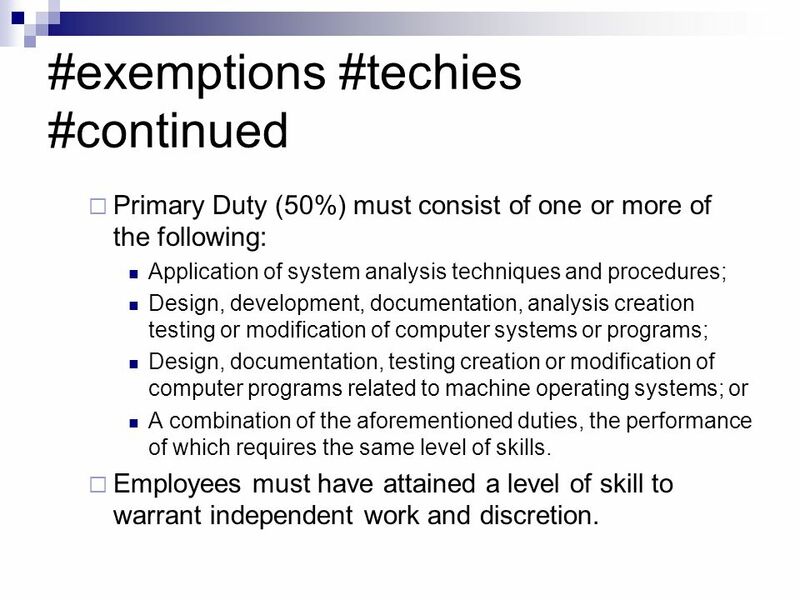 21 #exemptions #techies #continued  Primary Duty (50%) must consist of one or more of the following: Application of system analysis techniques and procedures; Design, development, documentation, analysis creation testing or modification of computer systems or programs; Design, documentation, testing creation or modification of computer programs related to machine operating systems; or A combination of the aforementioned duties, the performance of which requires the same level of skills. 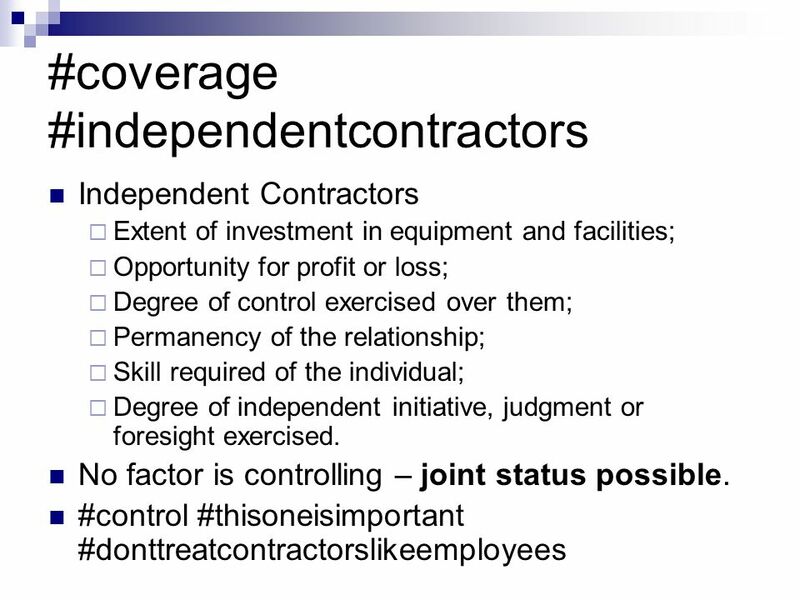  Employees must have attained a level of skill to warrant independent work and discretion. 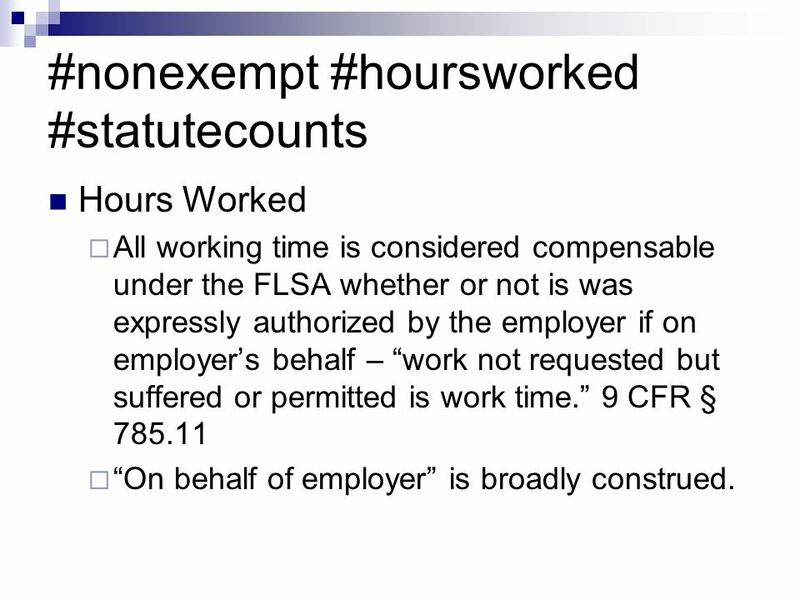 22 #nonexempt #hoursworked #statutecounts Hours Worked  All working time is considered compensable under the FLSA whether or not is was expressly authorized by the employer if on employer’s behalf – “work not requested but suffered or permitted is work time.” 9 CFR § 785.11  “On behalf of employer” is broadly construed. 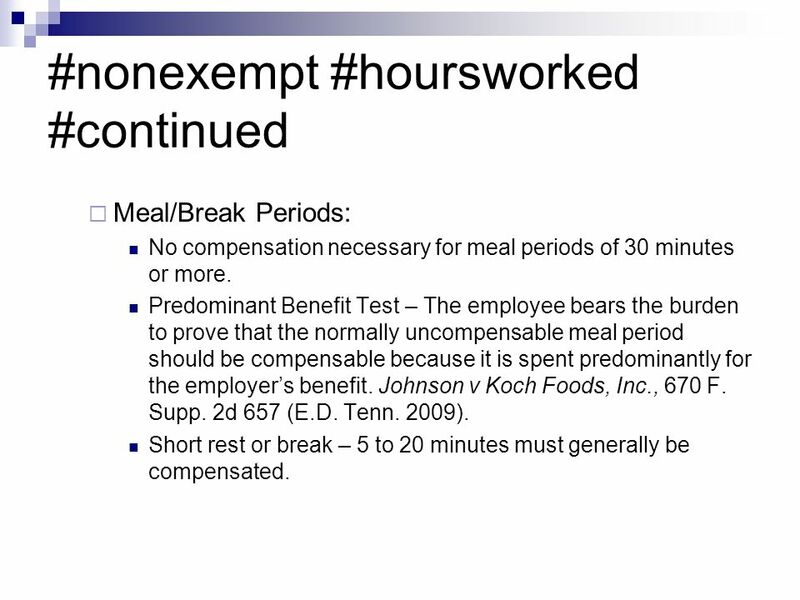 23 #nonexempt #hoursworked #continued  Meal/Break Periods: No compensation necessary for meal periods of 30 minutes or more. 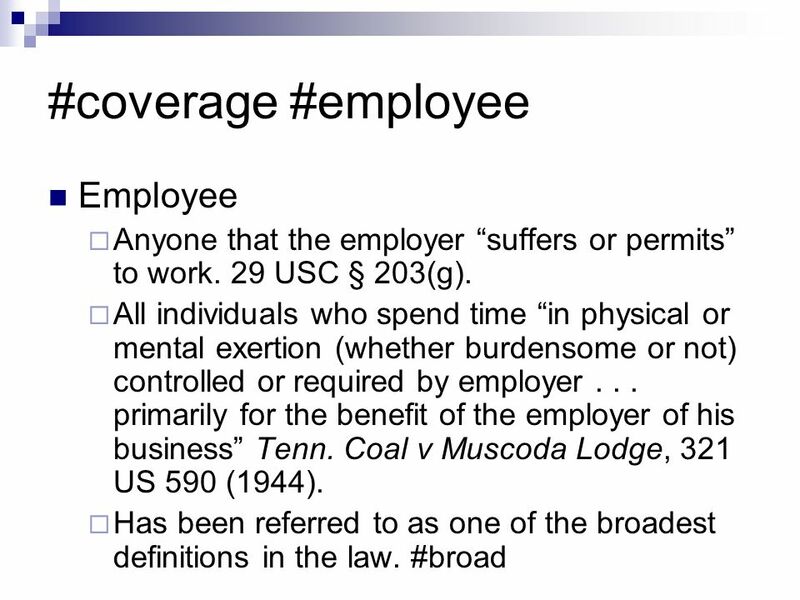 Predominant Benefit Test – The employee bears the burden to prove that the normally uncompensable meal period should be compensable because it is spent predominantly for the employer’s benefit. Johnson v Koch Foods, Inc., 670 F. Supp. 2d 657 (E.D. Tenn. 2009). Short rest or break – 5 to 20 minutes must generally be compensated. 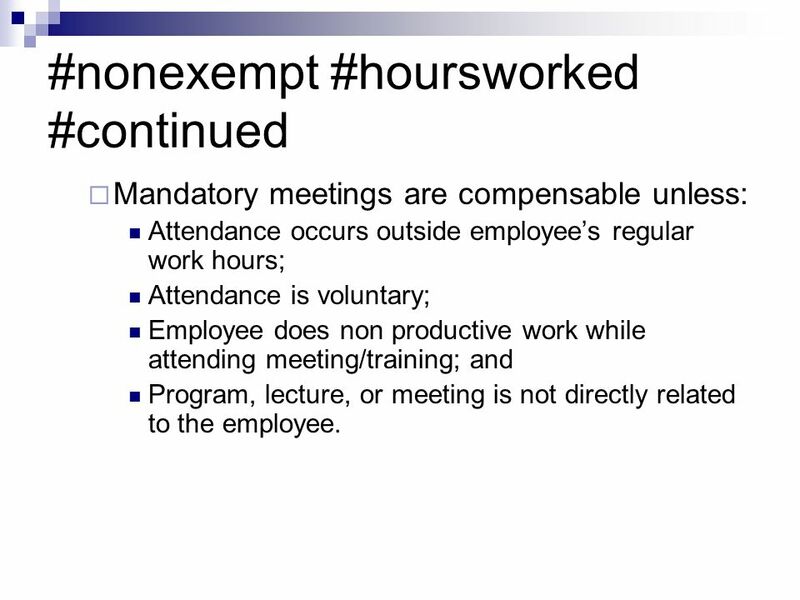 24 #nonexempt #hoursworked #continued  Mandatory meetings are compensable unless: Attendance occurs outside employee’s regular work hours; Attendance is voluntary; Employee does non productive work while attending meeting/training; and Program, lecture, or meeting is not directly related to the employee. 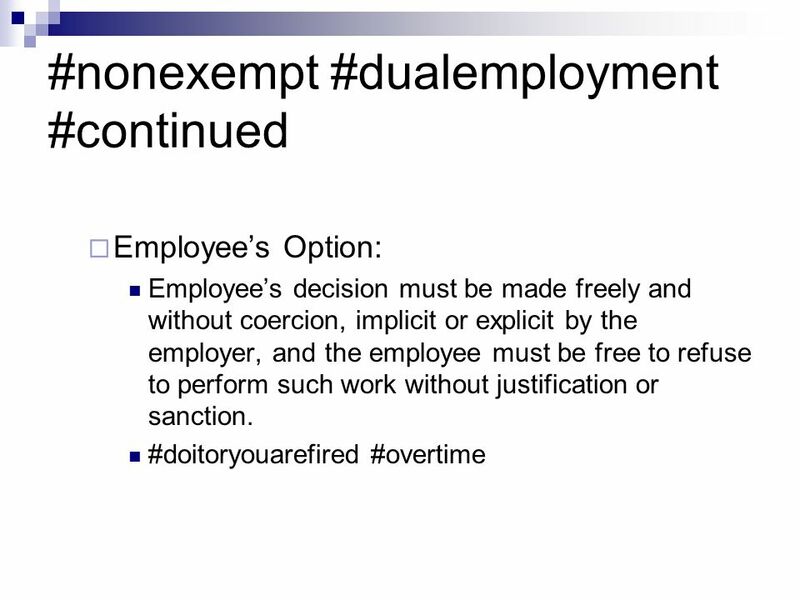 26 #nonexempt #dualemployment Dual Employment  The FLSA allows for the exemption of overtime pay for hours worked by non exempt employees that meet the following criteria: Work is solely at the employee’s option; Work is done occasionally or sporadically; and Work is done on a part-time basis for the same public agency in a different capacity from the employee’s regular employment. 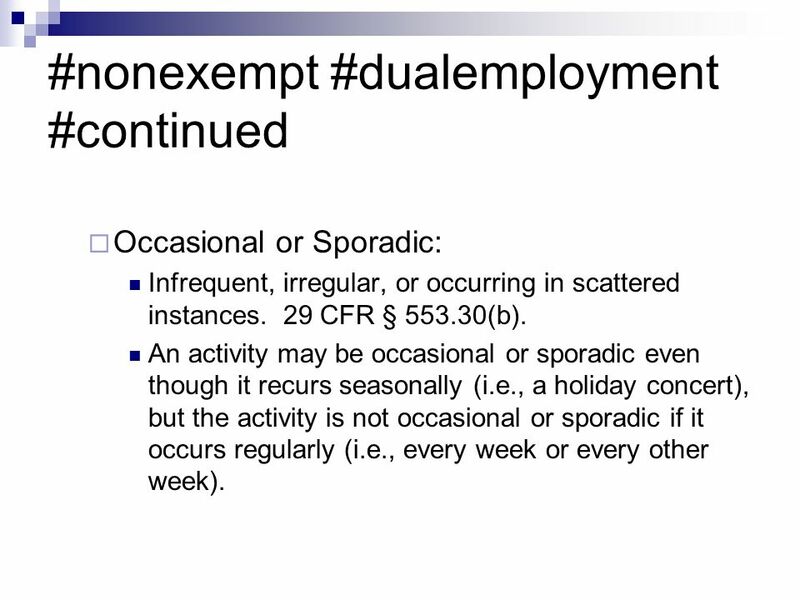 28 #nonexempt #dualemployment #continued  Occasional or Sporadic: Infrequent, irregular, or occurring in scattered instances. 29 CFR § 553.30(b). An activity may be occasional or sporadic even though it recurs seasonally (i.e., a holiday concert), but the activity is not occasional or sporadic if it occurs regularly (i.e., every week or every other week). 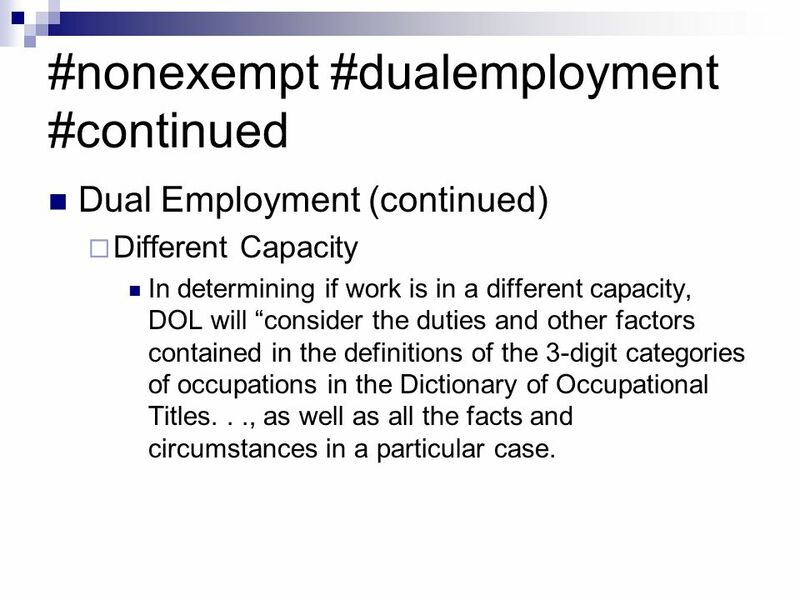 29 #nonexempt #dualemployment #continued Dual Employment (continued)  Different Capacity In determining if work is in a different capacity, DOL will “consider the duties and other factors contained in the definitions of the 3-digit categories of occupations in the Dictionary of Occupational Titles..., as well as all the facts and circumstances in a particular case. 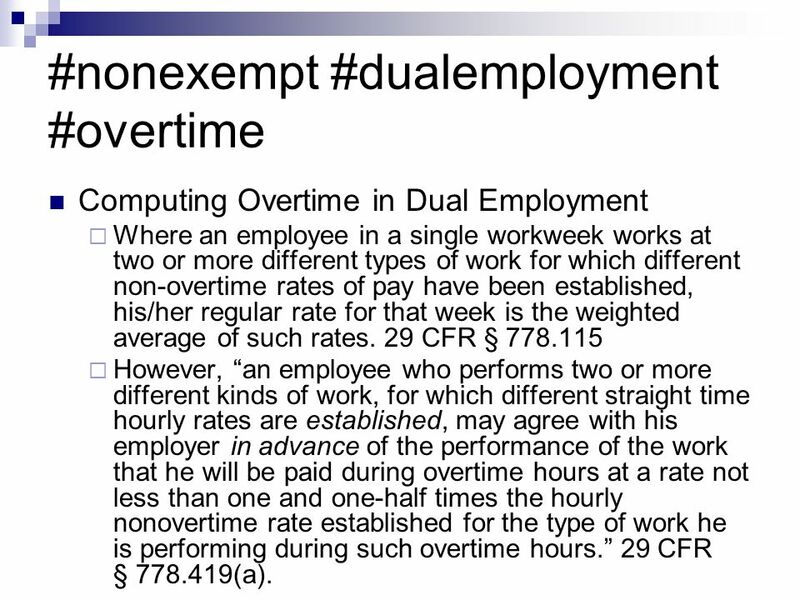 30 #nonexempt #dualemployment #overtime Computing Overtime in Dual Employment  Where an employee in a single workweek works at two or more different types of work for which different non-overtime rates of pay have been established, his/her regular rate for that week is the weighted average of such rates. 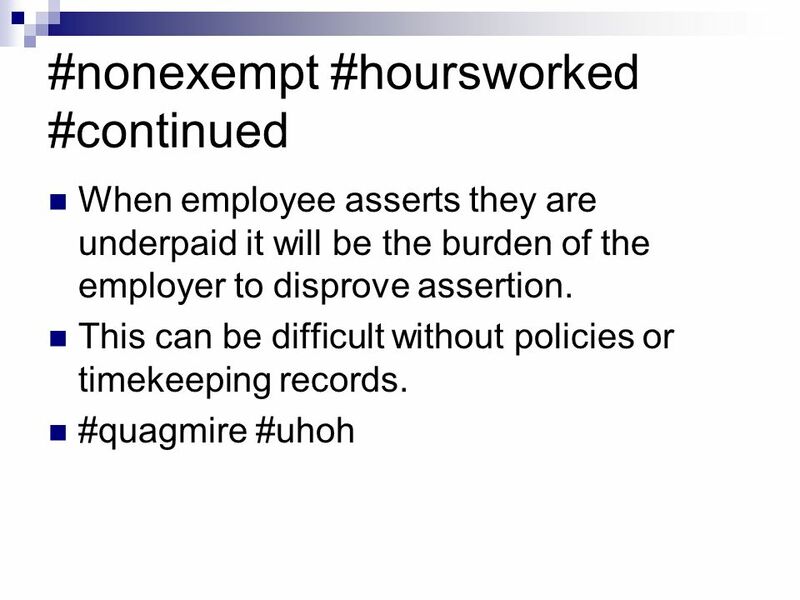 29 CFR § 778.115  However, “an employee who performs two or more different kinds of work, for which different straight time hourly rates are established, may agree with his employer in advance of the performance of the work that he will be paid during overtime hours at a rate not less than one and one-half times the hourly nonovertime rate established for the type of work he is performing during such overtime hours.” 29 CFR § 778.419(a). 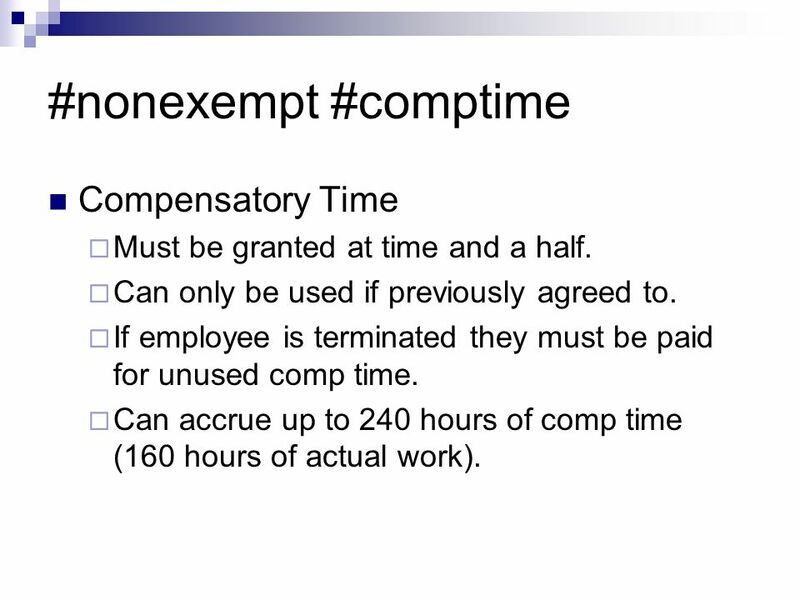 31 #nonexempt #comptime Compensatory Time  Must be granted at time and a half.  Can only be used if previously agreed to.  If employee is terminated they must be paid for unused comp time.  Can accrue up to 240 hours of comp time (160 hours of actual work). 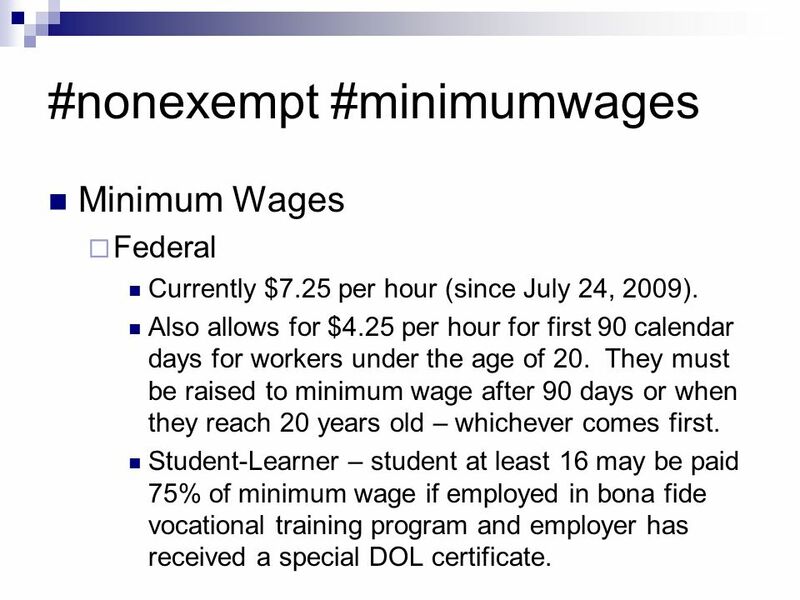 32 #nonexempt #minimumwages Minimum Wages  Federal Currently $7.25 per hour (since July 24, 2009). 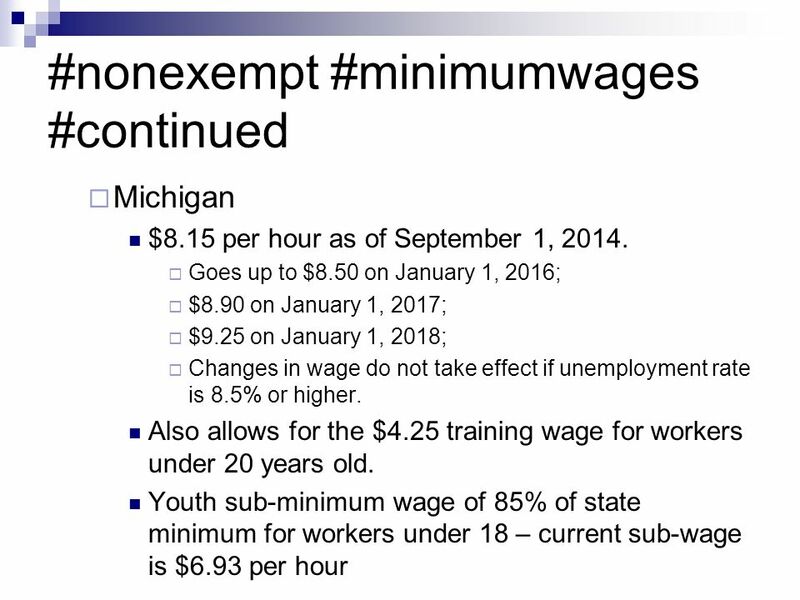 Also allows for $4.25 per hour for first 90 calendar days for workers under the age of 20. They must be raised to minimum wage after 90 days or when they reach 20 years old – whichever comes first. Student-Learner – student at least 16 may be paid 75% of minimum wage if employed in bona fide vocational training program and employer has received a special DOL certificate. 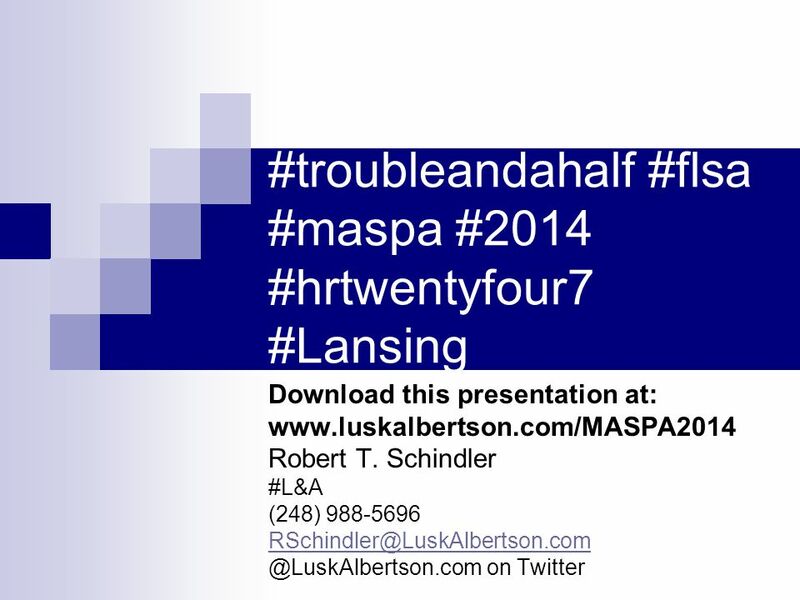 Download ppt "#troubleandahalf #flsa #maspa #2014 #hrtwentyfour7 #Lansing Download this presentation at: www.luskalbertson.com/MASPA2014 Robert T. Schindler #L&A (248)"
THE U.S. FAIR LABOR STANDARD ACT (FLSA) Getting Rid of the Sweatshop. Risk Management Initiative: Wage and Hour Issues for Employees and Supervisors Module Office of the Vice President for Ethics and Compliance Office of. 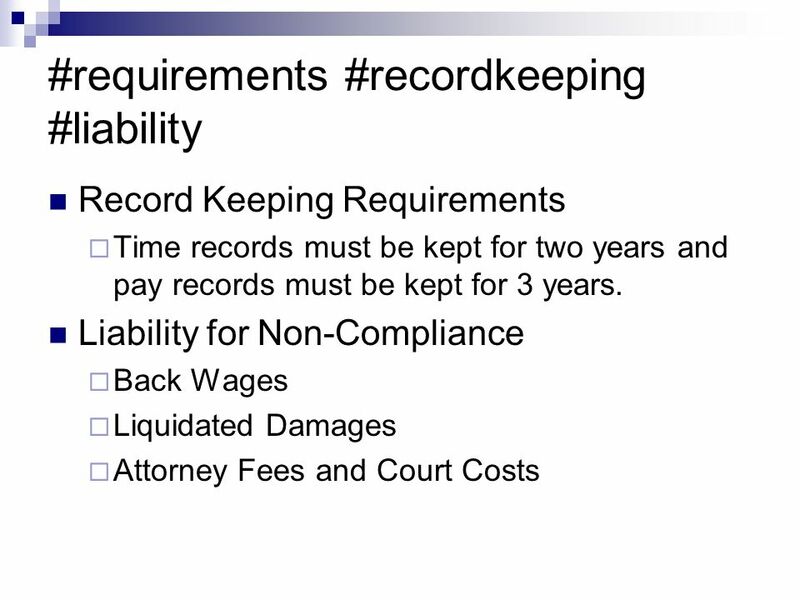 FLSA FAIR LABOR STANDARDS ACT Federal law that governs: Minimum wage (now $6.55 per hour) Minimum wage (now $6.55 per hour) Recordkeeping responsibilities. Iowa State University Extension County Staff Overtime and Compensatory Time. Lloyd L. Fields Commissioner of Labor. Should ees be paid for the time spent donning protective clothing? Should ees be paid for the time spent walking. 18/24/20141 Wage & Hour Compliance TIMEKEEPING POLICIES AND PROCEDURES POLICIES AND PROCEDURES. Classifying Support Staff as Volunteers AASBO Spring Conference 2013 Presented by Brad Nassif, Business Manager Glendale Union High School District. Overtime & Fair Labor Standards Act Revised December 2, 2009. 1 Overtime & Fair Labor Standards Act. 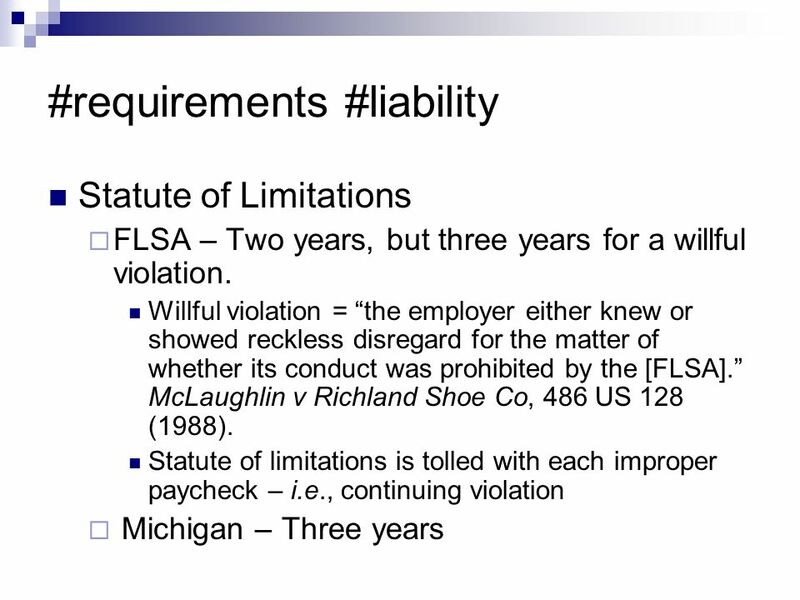 2 What is FLSA? Federal law passed in 1938 Enforced by Department of Labor Public employers became covered in 1986. FAIR LABOR STANDARDS ACT (FLSA) AND MORE MICHIGAN MUNICIPAL LEAGUE Public Employment Law Seminar January 23, 2013 Presented by:John J. Gillooly Garan Lucow. Presented by Human Resource Services Fair Labor Standards Act revised January 2013. FAIR LABOR STANDARDS ACT TO INCLUDE FAIR PAY The Fair Labor Standards Act (FLSA), enacted in 1938, and amended to include the Fair Pay Act of 2004 is the. 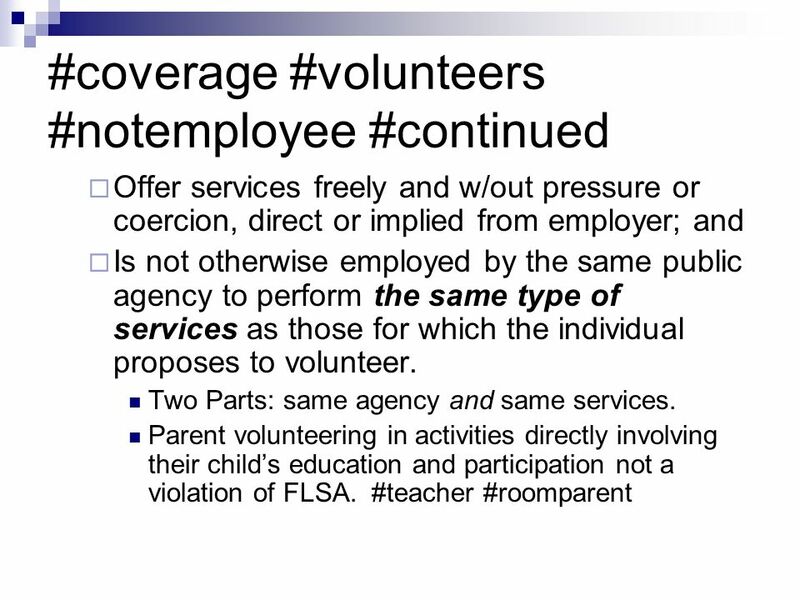 1 FLSA Fair Labor Standards Act 29 U.S.C., Sec. 201 et seq. Presented by Ramon Vigil Cuddy & McCarthy Law Firm NMASBO Fall Conference September 12, 2012. Avoiding Wage & Hour Pitfalls IASBO 60 TH ANNUAL CONFERENCE Shelli L. Anderson Franczek Radelet PC May 18, 2011. July, 2004 Computer Jobs & the FLSA. The Fair Labor Standards Act  Regulations first passed in 1938, and recently revised, were written to provide employees.